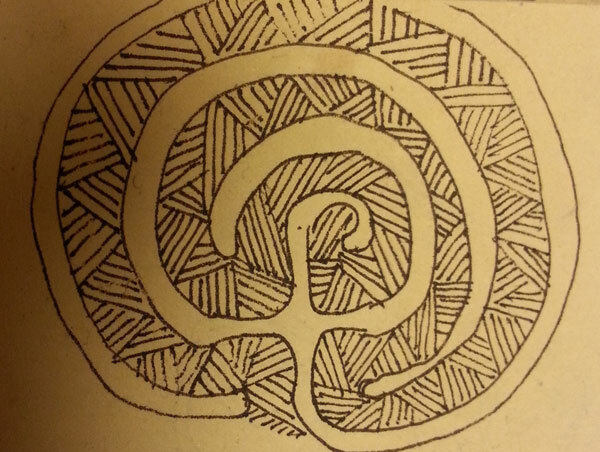 ← Zentangle, Old Books and Gelatin Prints, oh my! 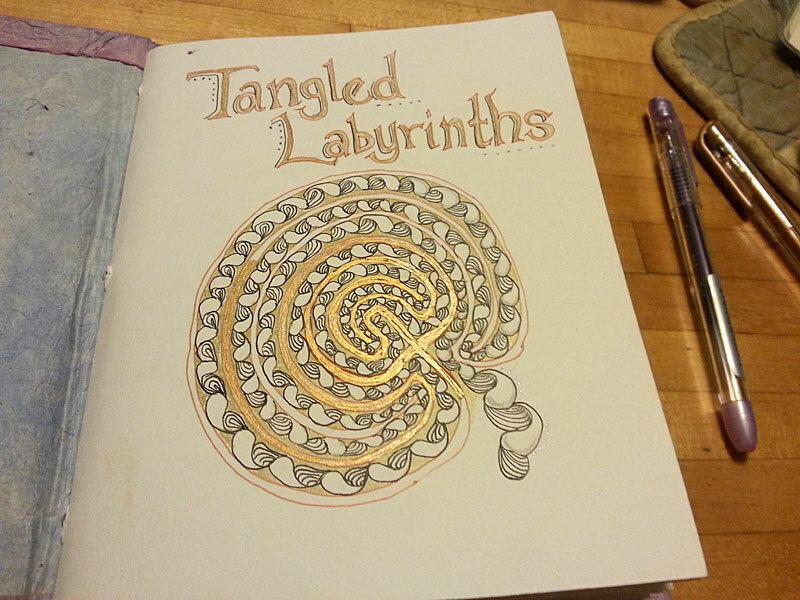 I’ve been playing with a simple handmade book lately, and labyrinth forms as focus exercise and use as a Zentangle string. Recently I also came across some simple painted labyrinth forms that have encouraged me to bring more color into creating a hand drawn finger labyrinth. So why labyrinths? I’ve always been drawn to the meditative and peaceful experience of walking a labyrinth, how it draws your entire being into a single-minded focus of forward motion. It brings you here, now, to concentrate on the very moment. 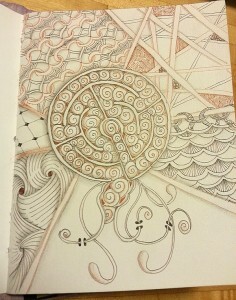 When I started experimenting with adding Zentangle to the experience, it opened up a whole new level of focus. 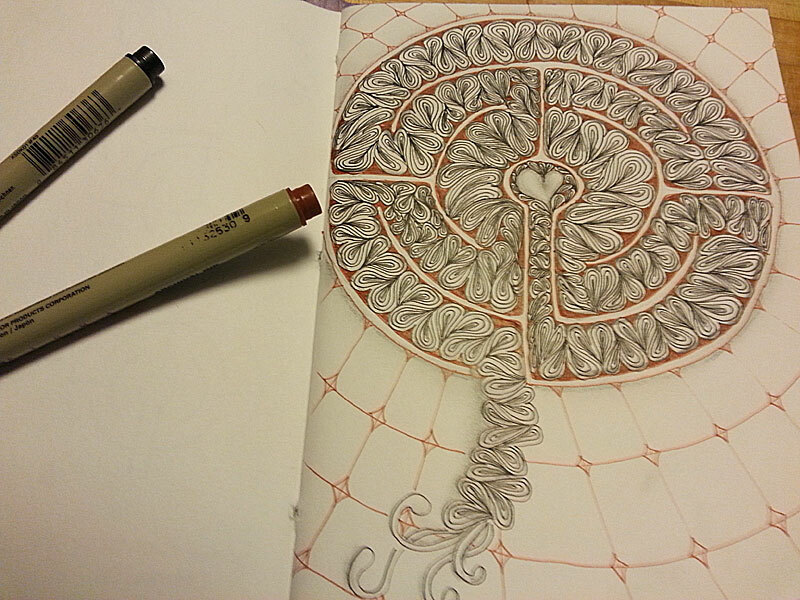 In 2013 I had the opportunity to teach a simple drawn labyrinth form, broke n down in Zentangle fashion, to a group of teachers at Sandy B’s studio as a small part of a Zentangle Spiritual retreat day. 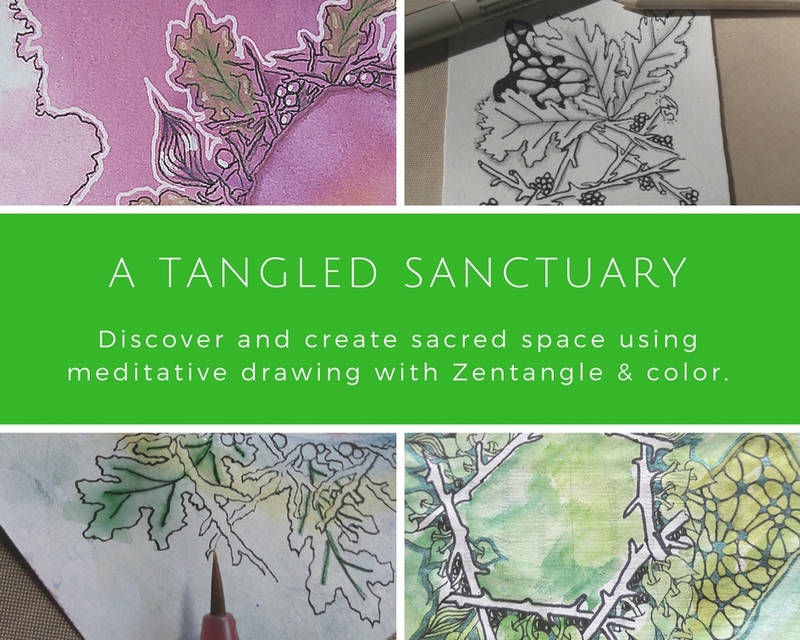 Next month, I am returning there to teach a full day of using Zentangle with Labyrinths, complete with your own handmade labyrinth journal. 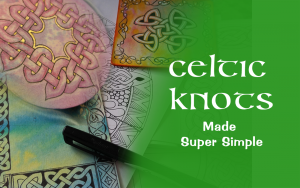 This workshop is open to anyone who has attended a Zentangle workshop with a CZT. 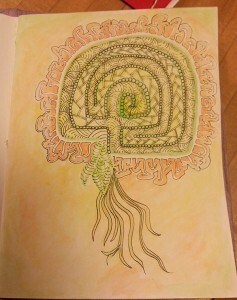 A full day of drawing and tangling with labyrinths! 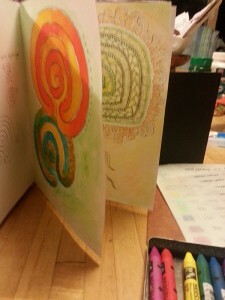 We’ll start the day by making a simple yet special sewn journal with a Lokta or Japanese rice paper cover, then dive in to learning to draw a variety of Labyrinth forms, broken down into steps. 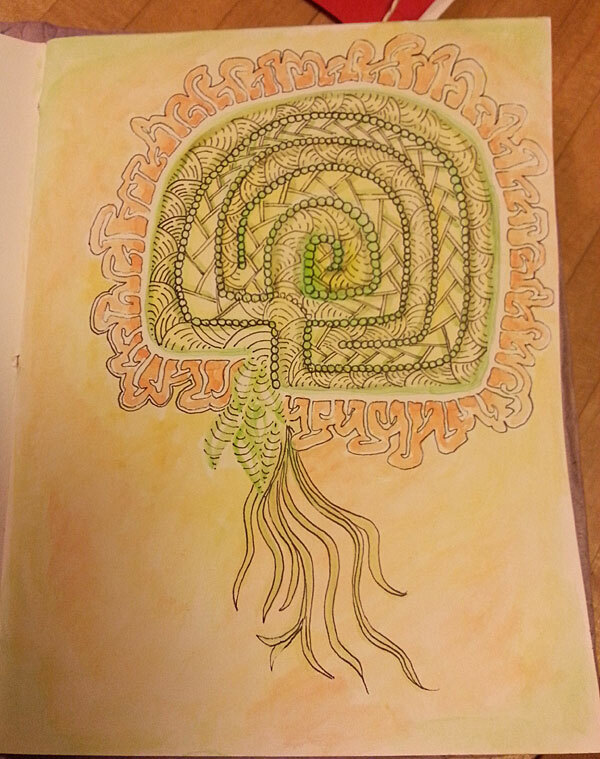 Learn and use tangles that work well for movement thru and ‘walking’ the path as with your pen and experience yet a whole new layer of focus with a guided meditation. 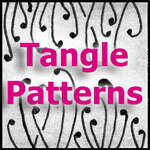 Includes ideas for setting up a few extra labyrinth string pages with color techniques for you to tangle in once you get home. This entry was posted in Labyrinths, Workshops, Zentangle® and tagged book arts, book making, bookbinding, labyrinth, labyrinths, meditation, workshop. Bookmark the permalink. Oh if only I lived closer I would so be there for this workshop. Look forward to hearing more on this project. I just love your tangled Christmas ornaments. I just downloaded some paper boxes and triangles to make ornaments. I make ornaments toppers from card stock , rhinestones , glitter and any thing I can glue to them. I would like to know if you have any tips to share with me for the tangled ones. I love boxes, so I will probably do those the most. I do a show in Nov. and sell them. Hi Sarah… Thanks! Regarding your question, probably my biggest tip when it comes to ornaments and especially when you are tangling on a substrate (surface) that is new to you is to TEST, TEST and TEST before committing your precious ink and objects. If you are using a new kind of pen or paint on a new surface, first test to see how it stays… does it rub off easily or get smudged? Use a test piece and then also try different finishes if making ornaments to sell. Some finishes will blur some inks and paints. When I was asked to tangle a paper mache dog for a fundraiser, I knew I would be working on a black acrylic painted surface with gel pens, so I took a piece of cardboard and painted it with black acrylic paint, then tested the gel pens I wanted to use. Then I divided the piece into sections and tested different acrylic clear coat sprays, finishes, mod podge, etc until I was sure I wouldn’t ruin the paper mache dog I was about to embellish.